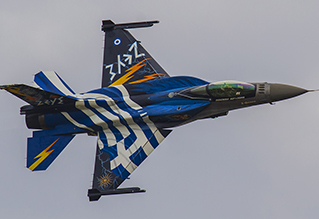 Held biannually, the Radom Airshow has built up a reputation in recent years as one of Europe’s biggest aviation events - with its geographical location attracting a diverse array of aircraft from both East and West. Cheap flights from the UK make the show a popular choice with British enthusiasts keen to see ex-Soviet hardware, with inexpensive beer an added bonus for all visitors! 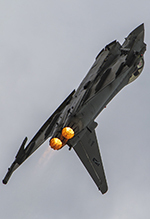 Peter Reoch travelled to Poland to report for UK Airshow Review, additional photography from Mark Leith. Radom neither looks nor feels like the 'traditional' choice of airfield for a large international airshow. Located in a heavily urban area, it was rather bizarre to be photographing airshow arrivals and practice displays from a residential street. Likewise, when it comes to the show weekend; the airfield doesn't offer any official parking areas - so local residents turn every bit of tarmac, grass or sand into impromptu airshow parking. That said; once you've battled the traffic, car parks, long walk into the base and security checks (including the removal of all liquids), the hassle becomes a distant memory once the great variety of aircraft on display becomes clear. 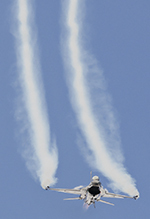 As would be expected, the Polish Air Force was demonstrated en masse at the show, with familiar favourites such as the MiG-29 Fulcrum solo and Su-22 Fitter pairs display appearing alongside a whole host of unique routines. Each day the host nation opened the afternoon flying display with a mass flypast featuring nearly every type in the Polish Air Force inventory. Formations of Mi-2 Hoplites, Mi-24 Hinds & Mi-8 Hips were a sight to behold for visiting enthusiasts, and in all 65 aircraft took part in the impressive spectacle. The workhorse of the Polish military, the W-3 Sokoł, featured in a solo & three-ship display which rounded off the flying display on both Saturday and Sunday. 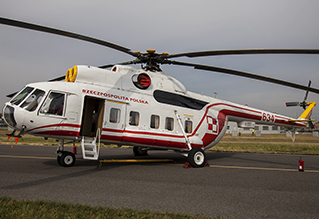 The Sokoł is a real success story for the Polish aviation industry, however it is rarely seen on display outside its home nation - making it a real treat to see the helicopters (in a variety of colour schemes) performing. Another impressive display not seen outside of Poland is a pairs routine of Mi-24 Hinds. An interesting combination of tactical manoeuvring and photogenic pivots, the display was a great chance to view the rarely seen drab green helicopters. Fans of display teams were well accommodated, with a mix of the European regulars and some lesser seen teams scattered throughout the afternoon’s flying programme. 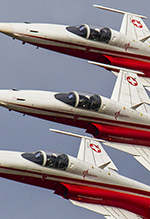 The Patrouille Suisse appeared for the final time at Radom with their F-5 Tiger II aircraft, putting on a polished performance as always in less-than-ideal conditions across the weekend. A surprise highlight for those present on arrivals day was the arrival of a grey F-5E which was used as the team’s spare over the weekend. It was unusual to see both of the Spanish Air Force’s display teams on show in one location, with Patrulla ASPA impressing with their unique helicopter formation display. 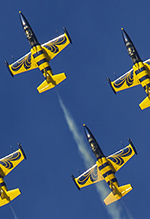 Their jet counterparts, however, failed to ignite any passion from the crowd with their very lengthy display. Another team which are also limited by the fact their mount is extremely underpowered are Team Iskry. Perhaps perceptions are easily skewed when the team appear on the same bill as world-leaders such as the Frecce Tricolori; but sadly the Polish team seem to spend the majority of their display repositioning - nor does the routine feature any stand-out manoeuvres to spice up their show. As well as the display teams, some of Europe’s best fast jet solo routines could be seen at the show, each bringing their own unique flair. The French Air Force Rafale has provided a masterclass in display flying for the past few years, and its appearance at Radom did not disappoint. 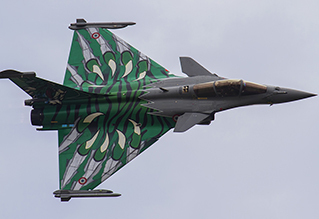 The display was flown using this year’s somewhat controversial NATO Tiger Meet colour scheme, which features a green sabre-toothed cat. Likewise, the Italian Typhoon solo display (again provided by the Reparto Sperimentale Volo) was a real treat to witness, with its routine making plentiful use of afterburner to showcase some interesting manoeuvres not seen in Royal Air Force solo displays of the type. 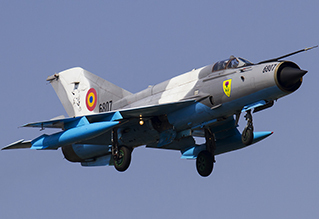 However, one of the most anticipated flying display participants was the MiG-21 LanceR, of which two Romanian Air Force examples were in attendance. While the classic Soviet jet fighter has the turning circle of an oil tanker, it still managed to put on an attractive display showing all angles of the aircraft - as well as a number of chances to hear the characteristic 'pop' as the afterburner is engaged. The static display was also of the highest quality, with examples of nearly every type in the Polish inventory on show. Highlights for international visitors included a SH-2G Seasprite, one of only four operated by the Polish Navy, a matte black Su-22M4 and an Mi-8PS in VIP configuration. There was also a healthy array of international visitors, most noticeably an Israeli KC-130H Hercules. Appearing in the traditional camouflage scheme but devoid of national markings, the aircraft appeared to be guarded by Mossad agents over the weekend! Other highlights included a trio of C-27J Spartans, Belgian Embraer 145 and Norwegian Falcon 20. The smaller aircraft types on static display were lined up along a taxiway, with an impressive array of European hardware including a Romanian MiG-21, Slovakian MiG-29, German Typhoon and Tornado, Austrian PC-7 - and, to complete the static line, a Royal Air Force Hawk T1. Much had been said about the RAF’s contribution in the run-up to the event, with many quick to point out the Polish military’s exemplary support for British events in this important Battle of Britain anniversary year. Obviously Radom’s clash with Bournemouth Air Festival – the UK’s largest airshow when measured in footfall – didn’t help the RAF Air Events Team, but many UK enthusiasts agreed with their Polish counterparts that the RAF was woefully underrepresented and that the Battle of Britain camouflage painted Typhoon FGR4 should have been present as a bare minimum. We must hope that the poor support shown doesn’t affect the ability of UK events to attract Polish military hardware in 2016. Besides the exciting array of aircraft, the showground also had an incredible amount of food outlets - with visitors almost spoilt for choice by a wide variety of high quality and extremely well priced options. Value for money is something we often address on UKAR and Radom Airshow certainly comes out on top in that regard, with tickets priced at 40 Złoty (approximately £7). The whole site had an extremely friendly atmosphere and it was certainly very relaxed, with plenty of aircrew on hand to give the visiting public tours of the aircraft and sell squadron memorabilia.